Violinist Philip Setzer, cellist David Finckel and pianist Wu Han open Lawrence University’s 2014-15 Artist Series Friday, Oct. 17 at 8 p.m. in Memorial Chapel with a program of favorite piano trios. 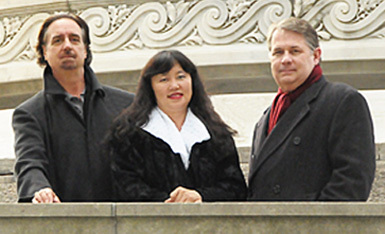 Violinist Philip Setzer, pianist Wu Han and cellist David Finckel have been hailed collectively as the “standard bearer” of the piano trio repertoire. Tickets, at $25-30 for adults, $20-25 for seniors and $18-20 for students, are available through the Lawrence Box Office, 920-832-6749. Internationally acclaimed, the “Han-Setzer-Finckel triumvirate” has been described by Edward Reichel of Reichel Recommends as the “standard bearer” of the piano trio repertoire. Setzer and Finckel, founding members of the celebrated Emerson String Quartet, have performed together for nearly 40 years. Samantha George, associate professor of music at Lawrence and a former student of Finckel’s and Setzer’s, said she is looking forward to hearing “such accomplished instrumentalists and chamber musicians live in concert instead of on a recording. “I am excited that my Lawrence students will have a chance to work with these great artists in a chamber music master class and attend the trio’s performance,” said George. Prior to their Friday evening concert performance, the trio will conduct a master class at 4:30 p.m. in Harper Hall. David Finckel, Wu Han and Philip Setzer. Setzer, Finckel and Han will perform three contrasting standards of the piano trio repertoire for their concert: Piano Trio in G major, Op. 1 No. 2 by Ludwig von Beethoven; Piano Trio in E minor, Op. 67 by Dmitri Shostakovich; and Piano Trio in C minor, Op. 66 by Felix Mendelssohn. The trio records regularly on Han and Finckel’s innovated label, AristLed. 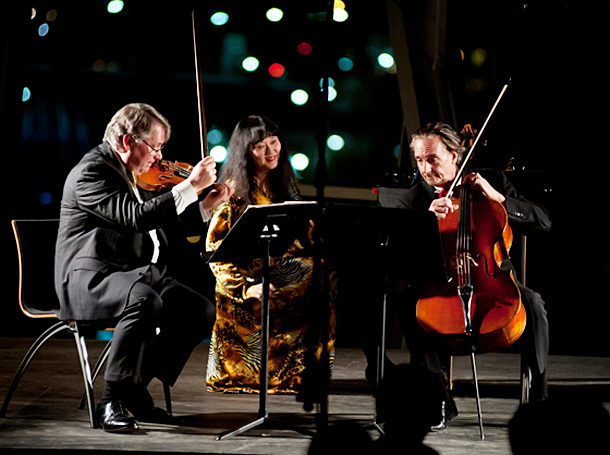 All 16 ArtistLed productions, including the trio’s recording of Dvořák’s Piano Trios, have earned with critical acclaim. Han and Finckel are currently serving their third term as artistic directors of The Chamber Music Society of Lincoln Center. They are the founders and artist directors of Music@Menlo, a chamber music festival and institute in Silicon Valley. Setzer is professor of violin and chamber music and SUNY Sony Brook and regularly gives master classes throughout the United States and abroad.